The sky was overcast when I awoke and went out for a walk around the grounds, accompanied by one of the cats. 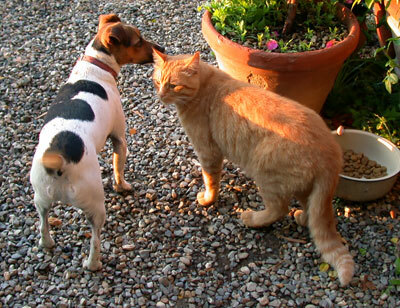 As we walked around the pool, the little dog came yipping and I thought he wanted to push the cat into the water, but it was just one of their games. The villa pets get along quite well. By the time we had our buffet breakfast, rain had begun to fall. We headed off to Monteriggioni, a small town inside the walls of an old Sienese fortress. The fortress stands on a hill and, with its fourteen towers, is a picturesque scene from below. Like many old fortified towns, cars are restricted to residents only. From the car park, we walked in the rain up to the town. It is very small, with a single courtyard around which there are a couple restaurants and a few other shops. Nothing was open at 9:00 AM Sunday morning except the small church where services were in progress. At this point, in the pouring rain, the town held no attraction for us, so we hopped back into the car and headed for San Gimignano. During the drive, the rain came down in torrents. Driving in this area is always difficult, but the downpour made it much worse for Al. Fortunately, by the time we got there, it had mostly stopped. 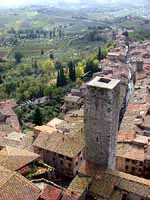 San Gimignano is Tuscany's best preserved, and most gentrified, fortified hill town, bigger than Monteriggioni, much smaller than Siena. It is best known for its many towers. 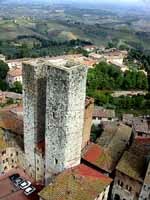 In the Middle Ages it was known as Citta delle belle torri (City of beautiful towers). At one time, in the 14th century, there were 70 towers as the nobility sought prestige by building as high as possible. In addition to being status symbols, they were also defensive strongholds during the incessant family feuds that plagued the city. Today there remain only 13 but they make a distinctive outline in the sky when seen from afar. Passing through one of the town's five gates, we walked down the main street to the Piazza del Duomo. There we found the Collegiata (Church) di Santa Maria Assunta, and the Palazzo del Popolo which is topped by the Torre Grossa. Unable to resist a spectacular view, we climbed the 200 steps to the top. There we could see the 13 towers, rooftops, the plaza below, the Duomo and the beautiful surrounding countryside. We could even hear a choir singing somewhere below. The sun was trying to break through the clouds, making the scene even more breathtaking. We had lunch at Enoteca Il Castello and finally experienced the fine Tuscan food we had been looking forward to. I had wild boar with parparelle and Al had white bean soup, both specialties of this area. Wonderful. We roamed the town, observing areas where locals lived as well as the shops. It was here I bought my only souvenirs of the trip, two wine corks. Back at the villa, the rain began again. We wanted to drive to Castellina-in-Chianti, a town north of Vagliagli, to try a pizza parlor highly recommended by friends back home. We started out at dusk but the road soon became unpaved and narrow. It was raining very hard, so we turned around and headed south to pick up a better route that would lead north to our destination. Even on this road, driving in a hard rain was nerve-wracking. But by the time we got to Castellina-in-Chianti, the rain was letting up. We found the pizza restaurant but it was so packed that there was a line outside. Instead, we chose Ristorante le Tre Porte. It was an excellent choice and we had another fine Tuscan meal. Just outside of town was a sign pointing to Vagliagli. It wasn't raining so we decided to take this shortcut back to the villa rather than the long circuitous route we had taken earlier. Well, it was quite a trip! The paved road quickly became unpaved. Not dirt that was slippery from the rain, but sort of a rocky dirt road that at least provided traction. But portions of it had deep gullies caused by today's heavy rains. And it was narrow, room for only one car. We passed one car when the road was still paved but what would happen if another came our way on this extremely narrow path? If we were forced off the road, we could easily become mired in mud. We drove on, the road winding up into the hills, with fog settling upon us and limiting our visibility to about fifteen feet. Very slowly, Al drove on. After what seemed like an eternity, the road widened a bit, and then finally we reached a paved portion. Almost immediately, another car was headed towards us but by now the road was wide enough for both. Soon we were back in familiar territory and made our way back to Villa Dievole. Al was exhausted.